On one side of the baking sheet, toss the potatoes with 1 tablespoon of the olive oil, and sprinkle with some salt and pepper; spread the potatoes into an even layer. Place the kielbasa on the other side of the baking sheet, leaving an empty place in the center for the foil tray. Brush the kielbasa with the remaining olive oil. Roast until the kielbasa begins to brown in spots and the potatoes are almost completely tender, about 15 minutes. 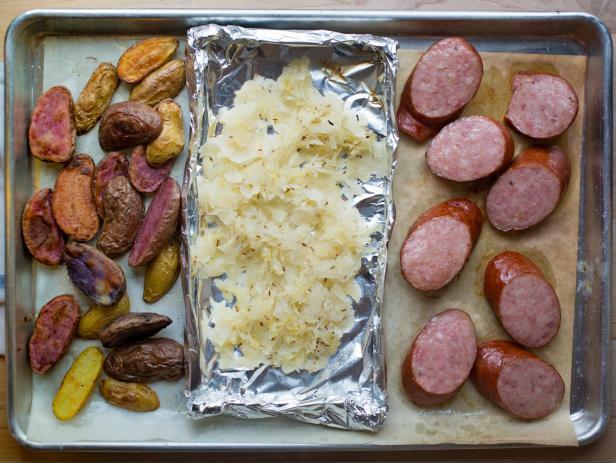 Toss the sauerkraut with the caraway seeds and spread into an even layer in the prepared foil baking tray. Place the foil tray in the center of the baking sheet. 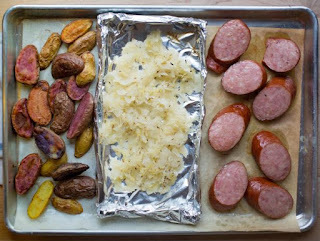 Roast until the potatoes are completely tender and browned, the sauerkraut is warmed through and the kielbasa is browned in spots, 15 minutes more. Divide sausage and vegetables between two plates and enjoy.